As the Valley's only Pre-K - 12 independent school, PCDS offers an unparalleled academic experience. From the joy of discovery, to the challenging application of complex concepts, PCDS students are uniquely prepared to face tomorrow's challenges today. The academic opportunities at PCDS are anything but cookie-cutter. Whether providing a well-rounded experience complete with art, music, PE, lab-based science, and Spanish language in the Lower School or an expansive array of course choices (132 different classes in 2017-18!) 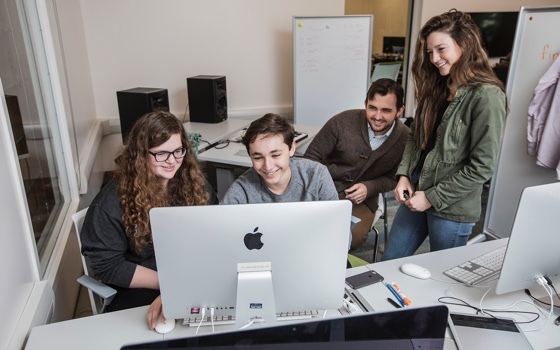 in the Upper School, students’ curiosities, passions, and engagement are always in full bloom. PCDS prides itself on creating a challenging, developmentally appropriate, and engaging academic program that brings out the best in all students. Curious about what’s happening in our classrooms and beyond? Dig in to our Lower, Middle, and Upper divisions. 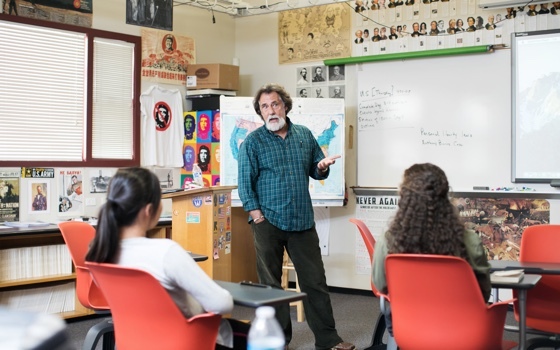 For over thirty years, Dave Martin has been breaking new historical ground in his Upper School History classes, and watching his students’ faces light up as they discover meaning and make connections. Fully embracing the academic freedom that has typically defined his classroom, Mr. Martin’s instruction has, over the years, bravely moved from the Western Canon traditionally taught in leading prep schools to a more innovative 21st century approach. Mr. Martin teaches three sections of what is now called US History Plus, a fall seminar on Comparative Genocide, and a spring seminar on Global Terrorism (incidentally, Mr. Martin has also presented a fascinating series of alumni lectures on Global Terrorism). A passionate advocate of learning through play, Ms. Gagner describes the role of play in the lower grades at PCDS as the “pathway to learning.” In a time when many schools are caught up in testing and rankings and have lost sight of the importance of play, PCDS embeds play into the entire Lower School program, via a developmentally appropriate practice and an environment that fosters high quality play. Learning through play is fun, engaging, and creates connections and bonds. Children develop cognitively, social-emotionally and physically through play. Neuroscience even points to the positive impact of play on the developing brain, not to mention language development. Play is multi-dimensional at PCDS, and examples are everywhere. Students have opportunities for solitary play and social play, both indoor and outdoor. They engage in dramatic play, construction-based play, representational play, raw material play, studio play, academic play, and discovery-based play. On the playground, they have Big Body play, sand play, equipment play, and construction play. Opportunities for play are structured and unstructured. Play has always been important in the early childhood years, and in the past, it just happened at school and in the neighborhood. Nowadays, since children are not playing outside in the neighborhood as often, play needs to happen at school. Educators, like Ms. Gagner and her colleagues, have become increasingly aware of the research and importance of play. Having a playful mindset is invaluable – it lends itself to having fun while teaching and learning, and guarantees joyful connections among Lower School students and teachers alike.